On Sunday, after a bit of shopping, I was sitting around, letting my wrist rest, and then I realized I hadn’t gotten a pattern ready for Tuesday! Oh, no! I usually try to be ready earlier in advance than this but with Friday’s Mad Mad Maker’s Winter Blog Hop Snowflake Coaster/ Applique post, I think I got a bit mixed up and thought I was good. Dunno. The other idea I had was to finally make the Christmas Wreath earrings into a pattern and post the how-to on the blog here. Unfortunately I can’t find my original pattern of it so I had to think up another pattern and perhaps next week I’ll get the pattern going for the earrings. 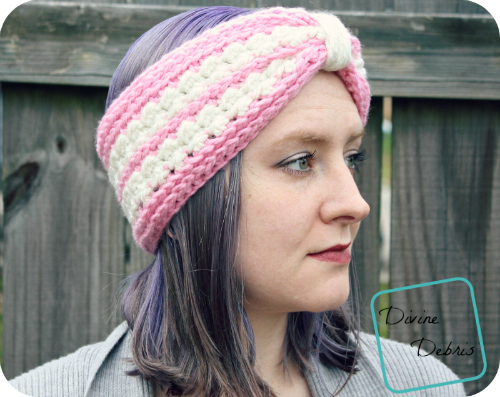 Anyway, I hope you like this headband/ ear warmer pattern. It’s another in the Diana Line, although I think it’d be super cute the cream rows in single crochets rather than the hdc/ slip st pattern. This ear warmer is worked in the round, with a slip st at the end of the row into the first stitch of that same row. There are turns on only SOME rows. Color A is the pink and color B is the cream. The gather portion is optional. You can wrap the yarn around, as the pattern indicates, or you could create a band with scs and attach it, or leave it off entirely. Create the gather portion around the seam and then you won’t have a seam anywhere on your ear warmer. Be sure to try the warmer on early, as this might be a bit larger than you want. 60 chs fit me, but you might want to go down to 58 or 56. Just keep your ch row (row 1) to an even number and you can adjust this pattern to fit your needs. You can make this with worsted weight yarn, you’ll just have to adjust your starting chain, presumably making it bigger. Just remember to keep it even numbers. Color A: Row 1: Ch 52 (60), slip st into the first ch to create a circle. Do not twist this circle. Fasten off both colors. Weave in your ends. 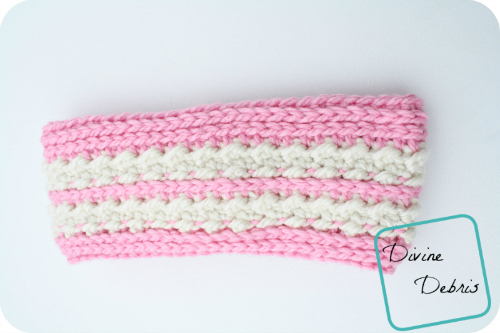 Using color B, wrap the yarn around the seam and pull tight, so that the headband/ ear warmer gathers. Wrap the yarn around as many times as you’d like, take care to adjust the warmer to be as fat as possible around the gather. When you’re happy with the way it gathers, leave a long tail and fasten off with color B. Weave in your ends, securely because you don’t want this part coming out. . You don’t have to do this step, as it looks cute without it (photo above). 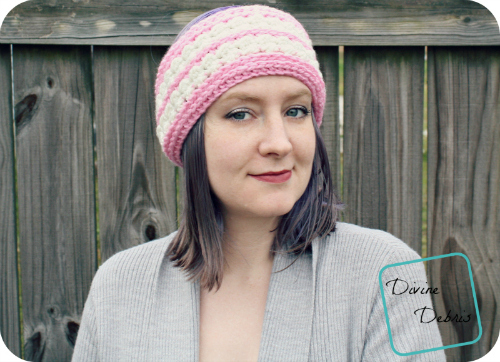 In other news, I’ve got a new pattern out, the Viola Hat (on the right). It comes in 3 sizes (18″, 21″, and 24″), uses superfine yarn, and it’s currently on sale for $2.12 (50 % off it’s regular price). If you’re in the US, I hope you had a great holiday weekend, I know it kept me busy. I’ll see ya next week! Oh, and today is the last day to enter my Red Heart Yarns giveaway! 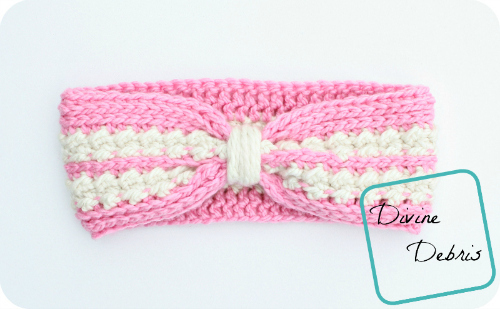 This post is linked to the Linky Ladies’ Community Link Party #28 & Fiber Tuesdays # 38. Until recently, I did not realize how warm these types of ear warmers actually are. I had a bit of left over wool yarn and decided to make a headband. It wound up being too wide, and works perfectly for an ear warmer. Maybe it is the wool, but it really is warm. I love the pattern you came up with. I am in the process of creating gifts for Christmas now, and this looks like a winning idea.